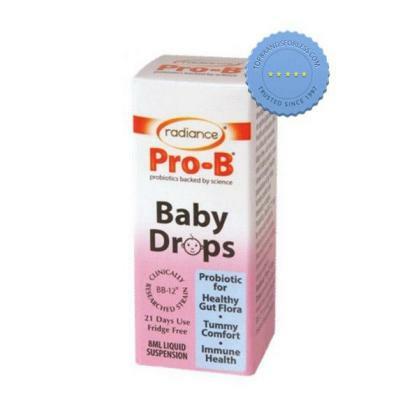 Helps provide babies with good probiotics using Radiance Pro B Probiotics Baby Drops 8ml Liquid Suspension. It contains Bifidobacterium lactis BB-12 - a stable and effective probiotic that promotes healthy gut flora for infants. It is suitable for babies from birth. What are the benefits of using this product? It contains the following: (Each 6 drops) Probio-Tec 1 Billion CFU (Bifidobacterium lactis BB-12) 100% vegetarian, Sunflower oil, Vitamin E and Citric Acid. It only contains Vitamin E and citric acid as preservatives. Shake well and administer six drops once a day, directly into the mouth, in breastmilk or in formula. Suitable for babies from birth. Use product within 4 weeks of opening. Product may settle. Make sure to read the label prior to use. Use only as directed. Do not exceed recommended dosage. Store in a cool dry place, away from direct sunlight and moisture. Keep out of reach and sight of children. Check the ingredients to determine if you are allergic to any of the contents. Do not use beyond expiry date. Do not accept if seal is broken. Caution in those allergic to dairy products. Should not adversely affect those with mild to moderate sensitivity to lactose. Discontinue use if rashes, itchiness or irritation is experienced. Buy online at a great price.